An inexpensive virtual reality head has finally become a reality of its own, as Samsung and Oculus announce a new edition of the Samsung Gear VR for just $99. VR headsets, which look a bit like strap-on binoculars, let you experience virtual reality through a personal screen connected to a gaming computer (as in the case of the Oculus Rift) or a smartphone, as in the case of the Gear VR and Google Cardboard. The newest version of the Gear VR works with most of new Samsung smartphones, including the Galaxy S6, the Galaxy S6 edge, the Galaxy S6 edge+ and the Galaxy Note 5. Enjoy movies, immersive VR games, 360-degree videos and other forms of experiential and VR content from devices connected via micro-USB. 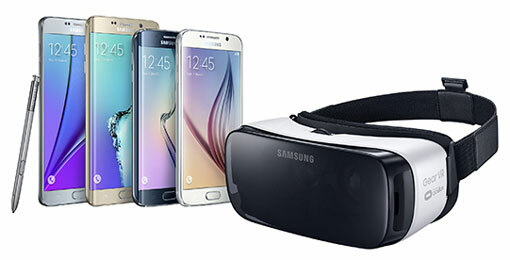 The earlier version of the Gear VR worked with only the Galaxy S6 and the Galaxy Note 4. If the wider range of compatible handsets doesn’t tickle you, maybe the new Gear VR’s price will. At $99, the Gear VR costs half the price of its previous version. Samsung said that the Gear VR, available in Frost White, will start shipping in November 2015 in time for Black Friday shopping. Not much has changed about the way the Gear VR looks. Weighing 22 percent less than the Gear VR Innovator Edition, it's also expected to be more comfortable to wear because of its new foam cushioning. The smooth trackpad in the earlier edition has been redesigned as a D-pad to make it easier to touch the directional buttons. The Gear VR includes an accelerometer, gyrometer and proximity sensor for detecting mounting and unmounting. The device is capable of a field of view of up to 96 degrees and covers interpupillary distances (IPD) from 54 to 70 millimeters. The Gear VR is available for per-order on Amazon for $99. For more information, visit the Samsung Gear VR.